Forty-five years ago today, Malcolm X was assassinated just as he began his opening remarks at the Audubon Ball Room in New York City. The talk Malcolm X was about to give was for the Organization of Afro-American Unity (OAAU), which had been former the previous year in 1964. Malcolm X is one of the most misunderstood figures in struggle for Civil Rights and the Black Power Movement. He is still viewed in dominant culture as a race hater and as someone who advocated violence, but Malcolm X was much more complex and was coming through a tremendous awakening in just the last few years of his life. One of the things that make Malcolm X so relevant to people working for radical social change was his transformation in prison from common thief to a person of deep self-awareness. 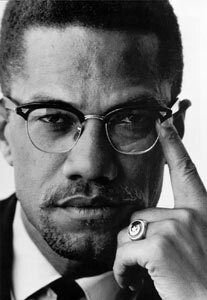 Malcolm’s transformation came about because of his acceptance of the religious teachings of the Nation of Islam. The young convert came into his own quickly and realized his gifts as an intellectual, public speaker and organizer. Malcolm helped the nation of Islam build numerous new mosques around the country, gain new members and national notoriety. However, divisions within the Nation itself led to factions arrayed against Malcolm as well as the fear that Elijah Muhammad (leader of the Nation of Islam) had with Malcolm’s politics. Shortly after he silencing Malcolm became aware of Elijah Muhammad’s misuse of power by fathering numerous kids from several different young women within the Nation of Islam. This revelation led Malcolm to leave the Nation and begin his second major transformation. Part of his new transformation included traveling to Africa and the Middle East. In these travels Malcolm came to see that Islam was a world religion that had the potential to unite people regardless of race. Malcolm X also met with leaders of anti-colonialist movements, which influenced his understanding of US policy and the importance of solidarity. Upon his return Malcolm began the Organization of Afro-American Unity (OAAU), which sought to build a much broader movement around civil rights, human rights and economic rights. Malcolm began to question more the economic exploitation under a capitalist model and felt that economic oppression is what would ultimately unit people. In the last years of hi life Malcolm X became more ecumenical in his thinking and wanted to build bridges with other religious and social organizations. 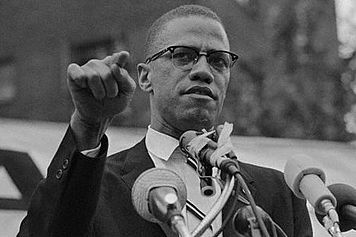 He began to be invited by radical labor groups and socialist organizations to speak about systems of oppression and Malcolm X was one of the first to acknowledge that we need to move beyond civil rights and start thinking about human rights. His assassination forty-five years ago robbed us of what he might have evolved to and what greater impact the OAAU could have had on the civil rights/black power movements. Here is an excerpt from a debate he took part of at Oxford University in December of 1964. This is an excellent example of his skills as a public speaker, but more importantly his analysis of the US is still quite relevant for us today.